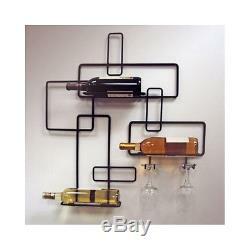 Wall-Mounted Rack Hanging Wire Contemporary Wine Bottle Iron Stemware Holder NEW! Brand New & Factory Sealed. Highest quality black powder-coat finish. Holds three bottles of wine and two glasses. Dimensions are 26"l x 4"w x 27h. This contemporary three bottle, two glass wine holder will marvel guests. The wine bottles rest horizontally in well positioned slots. Showcase two of your favorite stemmed glassware to achieve a gallery touch. This design attaches to the wall with perfectly positioned mounts. The sturdy iron is cured under heat to produce a durable black powder-coat finish. Welded fabrication means no assembly required. This product is proudly designed and made in the USA by jandj wire. Accessories shown and hardware for mounting is not included. The item "Wall-Mounted Rack Hanging Wire Contemporary Wine Bottle Iron Stemware Holder NEW" is in sale since Wednesday, April 20, 2016. This item is in the category "Home & Garden\Kitchen, Dining & Bar\Bar Tools & Accessories\Wine Racks & Bottle Holders". The seller is "rrs_25" and is located in Spring Valley, California. This item can be shipped to United States, United Kingdom, Denmark, Romania, Slovakia, Bulgaria, Czech republic, Finland, Hungary, Latvia, Lithuania, Malta, Estonia, Australia, Greece, Portugal, Cyprus, Slovenia, Japan, China, Sweden, South Korea, Indonesia, South africa, Thailand, Belgium, France, Hong Kong, Ireland, Netherlands, Poland, Spain, Italy, Germany, Austria, Bahamas, Israel, Mexico, New Zealand, Singapore, Switzerland, Norway, Saudi arabia, Ukraine, United arab emirates, Qatar, Kuwait, Bahrain, Croatia, Malaysia, Brazil, Colombia, Panama, Jamaica, Viet nam.